I have been warning for several years that many in bioethics and the organ transplant community hope to legalize killing for organs, that is, taking organs from the living. 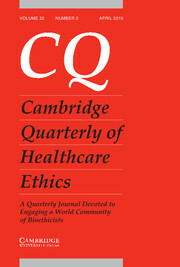 The latest example comes in the Cambridge Quarterly of Healthcare Ethics by Canadian philosophy professor (of course!) Walter Glannon. All transplant policies and protocols require that decisions about withdrawal of life-sustaining treatment be separated from decisions about organ donation,procurement, and transplantation. This prevents a conflict of duty for critical care teams, whose primary duty is to provide appropriate care to critically ill patients,as well as for transplant teams, whose primary duty is to patients with organ failure who need a transplant. Separating these decisions and duties minimizes the risk of compromising the care of critically ill patients and prevents treating them instrumentally as nothing more than a source of transplantable organs. I thought that was true, too. But the Organ Procurement and Transplantation Network permits discussion of organ donation to occur before the decision to withdraw life support. Glannon claims that death is morally insignificant in procuring organs. Many will emphasize that organ procurement before a declaration of death would be killing. But organ procurement causing death is not necessarily harmful to an organ donor. A donor may be beyond experiential harm before the permanent cessation of all brain or circulatory functions if he or she lacks the neurological and psychological capacity to be harmed. Moreover, donors may be the subject of nonexperiential harm if ischemia [organ decay] defeats their interest in donating their organs . . .
What matters is not that the donor is or is not dead, or when death is declared, but that the donor or a surrogate consents, that the donor has an irreversible condition with no hope of meaningful recovery, that procurement does not cause the donor to experience pain and suffering, and that the donor’s intention is realized in a successful transplant. These conditions are consistent with the principles of respect for patient autonomy and physician nonmaleficence. None of these conditions requires that donors be dead before organ procurement can proceed. A lot of water can flow under the “meaningful recovery” bridge.” And as Glannon writes, the pain free part can be accomplished through anesthesia. I wish Glannon were a lone wolf in this kind of thinking. Alas, as I have written elsewhere, such articles are becoming ubiquitous. But here’s the thing: I can’t think of a better way to undermine public support for organ transplant medicine than to permit killing for organs. Not only is this kind of advocacy foolhardy, but it would have the transplant community break solemn public policy promises made to gain support from a public wary of the entire enterprise.